Board games are a great way to have fun with friends. They’re also an amazing way to get to know other people. Sometimes, though, they can also be an awful way to get to know other people. 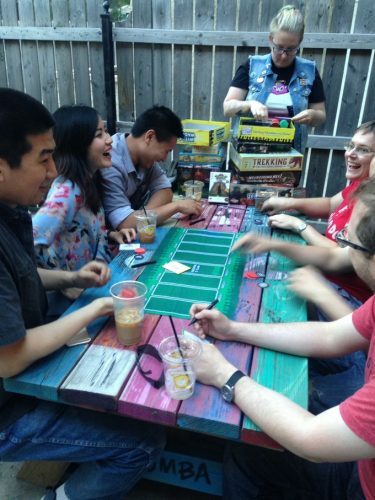 Recently, I found out about Bonus Round: Chicago’s first board game cafe on Kickstarter. (Hooray! They passed their funding goal and now they’re trying to reach their stretch goals.) What struck me about Bonus Round was not just that they wanted to make a space in Chicago for board game players and board game designers, but that they were dedicated to forging a space that would reach people who have been traditionally excluded and/or burned by board gaming culture. I reached out to Bonus Round to hear more about their story, and they agreed to an interview. I’m excited about the work they’re doing, and I hope you’ll join me in supporting them on Kickstarter, whether you’re in Chicago or another city! Your Kickstarter seems to really focus around building a welcoming board game community. Can you tell us a little more about what this means for Bonus Round? Building a community and making sure it is a welcoming one are definitely two of our biggest focuses. Board gaming is a group activity and what we’re creating revolves 100% about building a space where people can come together to enjoy games regardless of their level of experience or background. Unfortunately there are a lot of brick and mortar game stores around the country that don’t have the most welcoming environments to outsiders (particularly women) and so part of what we’re trying to do is encourage people who don’t normally play boardgames for whatever reason to take a chance on them. We want to introduce new people to board games. The Bonus Round Kickstarter video. I love that your Kickstarter states that Bonus Round will have “a safe and welcoming environment with a posted and enforced anti-harassment policy.” Can you tell us more about why this is important for your vision for Bonus Round? Yeah! So for me this is pretty simple and it seems like our policies ought to just be common sense for a lot of society. In a nutshell it comes down to “Don’t be a jerk to others.” & “Your enjoyment of the space and what we’re doing shouldn’t infringe on what anyone else is doing.” Some folks have been burned before, and we want to do everything we can to prevent that from happening at our cafe. Having a posted policy on the wall shows people that we’re serious about it and that if someone is causing problems that we’re gonna be there to stop it. Incidents are gonna happen and tensions can get heated during an intense game but at the end of the day we want to make sure that everyone is being given the same amount of respect. Your Kickstarter says that you want “to be a corner stone meeting place for Chicago’s game development community,” somewhere that game designers can playtest with the public, build relationships, and exchange ideas with each other. As a game designer, I love this! What gave you this idea? And how do you see this idea coming to fruition? Being a watering hole for local designers, publishers and developers of games has always been something that we wanted to aim for with Bonus Round, but we always figured it would be something a bit further down the line. We’ve been doing pop-up events for a solid year and a half now, and somewhere along there designers started hitting us up to see whether they could bring their games out to show off or playtest. People don’t seem to realize just how many board game industry folks live in or around Chicago, and it blows me away how much support they’ve shown for Bonus Round! In the future once we have our doors open we want to have monthly gatherings at the cafe where insiders can get together to share war stories and ideas. Additionally we want to have regular nights at the cafe where developers & publishers have a chance to get their games playtested with the public. Playtesting can be a really long and drawn out process (not to mention costly). The funny thing is that the public are usually pretty enthusiastic to try something new and give feedback, but outside of conventions there isn’t much of a place to bring everything together. I’d be remiss if I didn’t give a shout out here to Ben at Argyle Games as well as Jeff & Andrew with Road To Infamy Games, they’ve all been really supportive of what we’re doing. When did you decide to take your dream of a board game cafe and make it a reality? And why did you decide to turn to Kickstarter? Okay so the moment that Courtney & I decided that this was what we were going to pour ourselves into was probably about 4 years ago. I was managing a record store in California at the time, which was a great experience that I learned a lot from, I was enjoying working there but ambition was getting the best of me and for the longest time I had wanted to create something myself. So that was all going through my head and a year or two prior to that even we’d gone to Toronto on our honeymoon and visited Snakes & Lattes, who have been at the forefront of this board game cafe movement. Eventually it all came together and we knew we had the skill sets to do this already; we just needed to put in the work and get all the money together. It hasn’t been easy for a moment, and it has been really trying at times, but we’re not far off from being able to break ground and get our doors open. We’ve always been pretty active on Kickstarter and done what we can to help fund projects which we care about and want to see come to life, it made sense that once we got to the point which we’re at now that we’d turn things around and create a campaign of our own. I feel like I could write a book about everything that has happened so far with the cafe, our trials and tribulations, but I couldn’t be more proud of where we are and those struggles have definitely helped me appreciate it. You say that your staff will be trained to help customers learn the board games you have at your cafe. I think that’s fantastic. Why’s that important for your vision of Bonus Round? a) Our target audience consists of a lot of people that have NEVER played a modern board game, the last thing they might have played is probably Monopoly or Clue at a gathering with extended family. The thing is board games have come such a long way from that and are an incredible way to enjoy some genuine social time with others. So with all that said we’ve got a lot of newcomers coming out to our pop-ups and when you’re learning something new, whether it is rocket science or board gaming, you’re in this space where you might feel like everyone but you knows what’s going on. A few laughs and some encouragement go a long way towards getting people to open up. I’m getting a little rambly here but one of the reasons teaching is important is if you do it well then people can’t wait to join in. b) The second reason is way more straightforward. Nobody wants to sit down with their friends and have to scramble through a rule book for 30 minutes before they can even start enjoying the game. We cut that whole process out and get people right to the fun part by figuring out what the “teach” is for a game, what are the essentials that people need to know before they can take their first turn or roll some dice? In many cases some rules of the game can be introduced after everyone has had a turn with almost no impact on how the game was played up until that point. Each game has its own approach but we take the time and figure it out so that our customers can just focus on having a good time. Has your Kickstarter campaign allowed you to reach new audiences? We’re not using Kickstarter just for the money, Kickstarter helps build a community around your project from day one. Since everything else we’re doing is so community oriented it makes sense that we’d go to Kickstarter. It has definitely helped us garner some more attention, but for me the most exhilarating part of all this has been how much people have come out of the woodwork to share what we’re doing with their friends and family. People that might’ve only ever come out to one or two pop-up game nights have taken the time to say how thrilled they are for us. That said, I want to see that audience grow even more and I can’t wait for us to finally have our doors open! Image via Bonus Round Kickstarter page.